One of these organized groups of Vietnamese was revealed by the staff of the State Border Guard Service and Head Deparment of National Police in Transcarpathian region at the support of the response unit of the Chop Detachment. They stayed in the private house without any documents and waited for the smugglers to choose a propoer moment for their transportation to the EU countries. Each of them had to pay $ 15 thousand for the “trip”. Generally, during the six months of 2018 the border guards detained 207 illegal migrants for their attempt to cross the border, simultaneously last year for the same period 65 Vietnamese were apprehended. Thus, a sufficient part of the migrants from Vietnam gets to Ukraine by illegal way from the RF. The SBGS informed repeatedly that Russian special services assit illegal migrants in these trips. During their travelling to the destination point the majority of the migrants have to wait for months, often hiding in the basements or neglected buildings. The same happened with the group in Transcarpathia. Meanwhile, at the channels of legal entrance to Ukraine the border guards registered 2360 citizens of Vietnam in the year 2017, and for the same perios this year – 1774. There is decrease in the passenger flow as well as in the number of those Vietnamese, who were anable to confirm the aim of their trip (6 months of 2017 – 35 persons, 6 months of 2018 – 23 persons). Considering the fact that Vietnamese are usually detained in groups at the border, it may bear an organizational character in the smugglers and accomplices’ actions, who most likely act not only within the territory of Ukraine and beyond its borders. It is of interest that recently the issue on the increase in the nuber of Vietnamese migrants is discussed at the meetings of the border departments as well as by the border guards of the EU countries. Thus, this problem was considered at the meeting of the border departments of Ukraine, Slovakia and Romania. In this context the parties exchange actively with available information about the activity of the organized criminal groups and possible border violations. 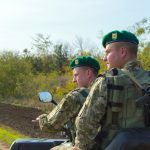 This entry was posted in Translated Media-News from Ukraine and tagged border guards, channel, EU, RF, Transcarpathia, Vietnamese on July 11, 2018 by oksana.